Torch Bay Nature Preserve is a leg stretcher. Located just off US-31 between Elk Rapids and Charlevoix, the 40-acre preserve is overlooked by most speeding their way north despite its brown sign along the state highway. Need to stretch? This park is an ideal stop.The preserve includes mature forested dunes, a dune-swale complex, beach ponds and more than 700 feet of Grand Traverse Bay beach. Extending across it is a limited trail system with the majority of it being the nearly mile-long Torch Bay Nature Trail. Torch Bay Nature Preserve is a leg stretcher. Located just off US-31 between Elk Rapids and Charlevoix, the 40-acre preserve is overlooked by most speeding their way north despite its brown sign along the state highway. Need to stretch? This park is an ideal stop. The preserve includes mature forested dunes, a dune-swale complex, beach ponds and more than 700 feet of Grand Traverse Bay beach. Extending across it is a limited trail system with the majority of it being the nearly mile-long Torch Bay Nature Trail. Amenities are meager but do include an unimproved boat launch ideal for launching kayaks or paddleboards. The wooded tract was destined to become a subdivision of upscale homes in 1991 when Torch Lake Township residents contacted the Grand Traverse Regional Land Conservancy in regards to preserving the area. 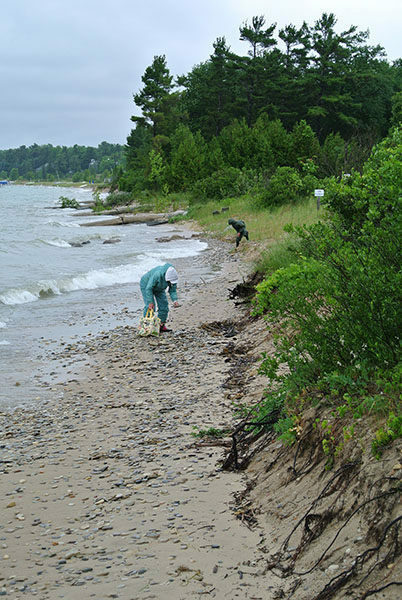 The GTRLC worked with the property owners and using a grant from the Michigan Natural Resources Trust Fund and purchased the property in 2000. 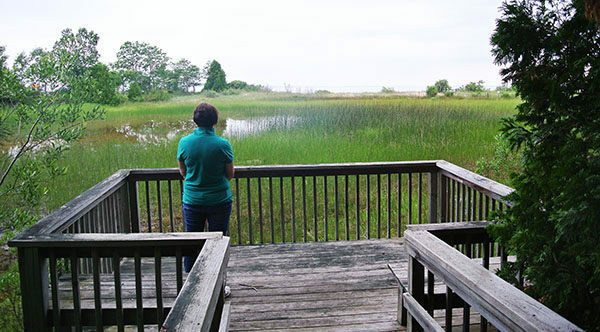 Locals used additional funds from a Coastal Zone Management grant and volunteer labor to build the trail system, interpretive shelter and viewing platforms of the beach pond and south wetland. 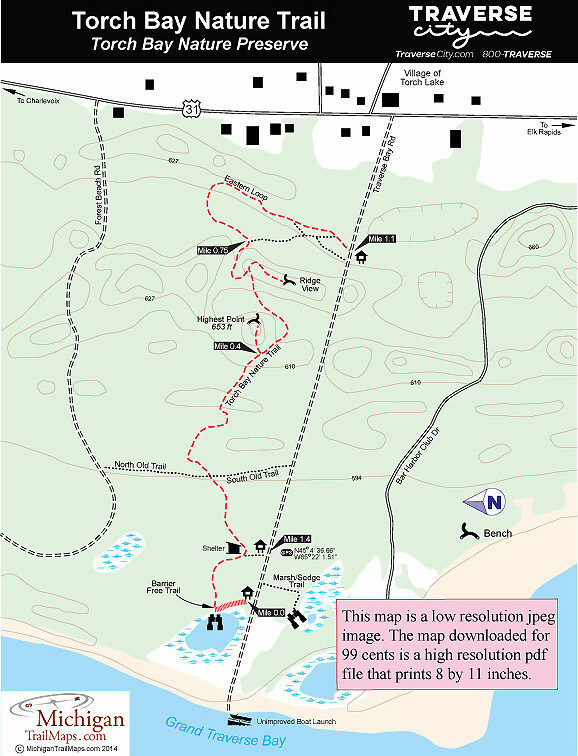 This hike is a 1.4-mile walk through the woods that includes almost all the trails and finishes with a stroll down Traverse Bay Road back to the trailhead. The main parking area is well marked and can handle several cars and even boat trailers. From there stroll a few yards west along Traverse Bay Road to pick up the Barrier Free Accessible Trail, a wooden boardwalk that leads 200 feet to the beach pond viewing deck. 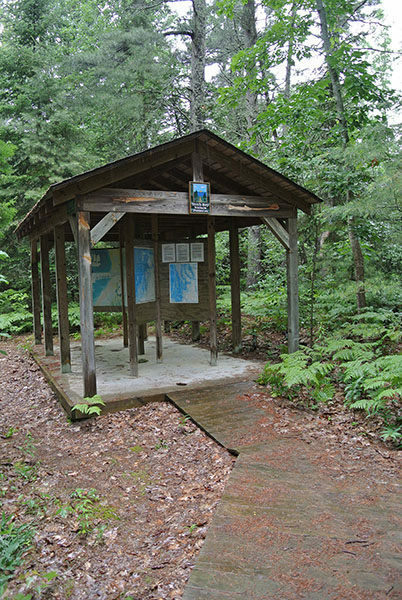 From there a trail heads east, quickly swings past the interpretive shelter and continues into the interior of the preserve as the Torch Bay Nature Trail. In less than a half mile you cross Old Trail and arrive at the posted junction with the spur to the preserve’s highest point. Steps assist as you climb a ridge less than 100 yards to a spot that is only 69 feet above Grand Traverse Bay. There is a bench but most of the year not much of a view due to the surrounding foliage. Just up the trail is a second spur to another “ridge view” and bench. From here the trail descends through an interesting terrain formed by the wooded dunes and old beachlines from when Lake Michigan was a much higher level. At Mile 0.75 you reach the junction with the Eastern Loop. This trail swings through the most eastern section of the preserve before returning to Traverse Bay Road at Mile 1.1. It can be hard to follow in the beginning in which case just stay on the easy-to-follow Torch Bay Nature Trail that also emerges at the dirt road. Head west on Traverse Bay Road through its canopy of foliage for a third of a mile to return to the parking area. The preserve includes parking areas and an undeveloped boat launch at the end of Traverse Bay Road along with the interpretive shelter and viewing decks. There are no restrooms or sources of drinking water. There are no fees or vehicle passes required to visit Torch Bay Nature Preserve. Torch Bay Nature Preserve is just off US-31 in the tiny hamlet of Torch Lake, 13 miles north of Elk Rapids. 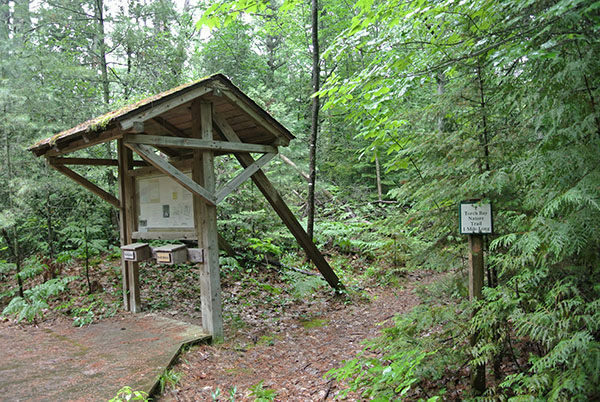 You reach the trailhead and parking area by heading west on Traverse Bay Road. 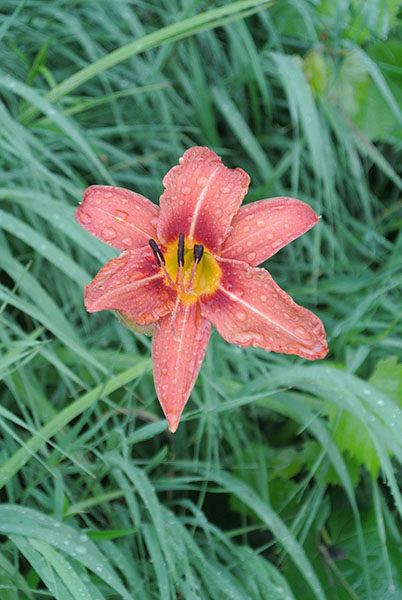 For more information contact Torch Lake Township at (231) 599-2036 or the Grand Traverse Regional Land Conservancy Conservation District (231-929-7911). For lodging or travel information contact Traverse City Tourism (800-872-8377).